Birmingham has featured in The Royal British Legion’s annual Poppy Appeal launch today with an installation at the city’s main library. 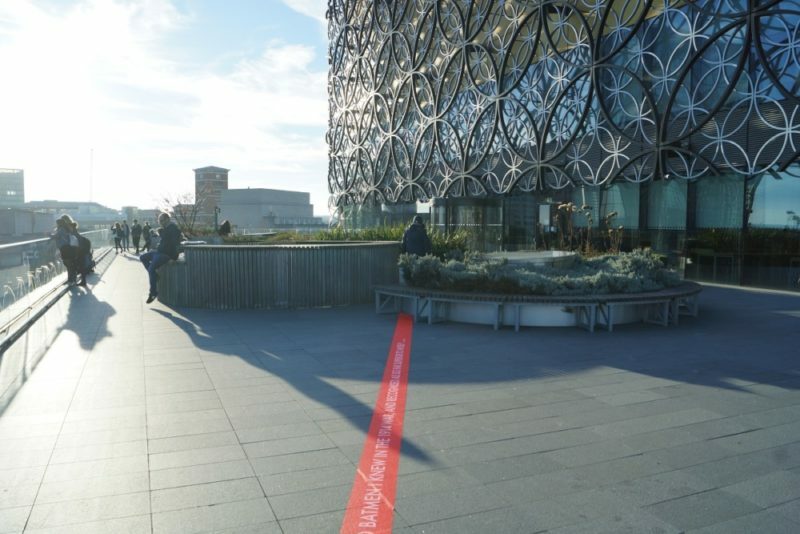 The ‘red thread’ art at the Library of Birmingham is one of a series of installations across the UK that highlight reasons to say ‘Thank You’ to the First World War generation. The Legion is calling on the nation to wear their poppies with pride and back its ‘Thank You’ movement in the year that marks the end of the First World War centenary. 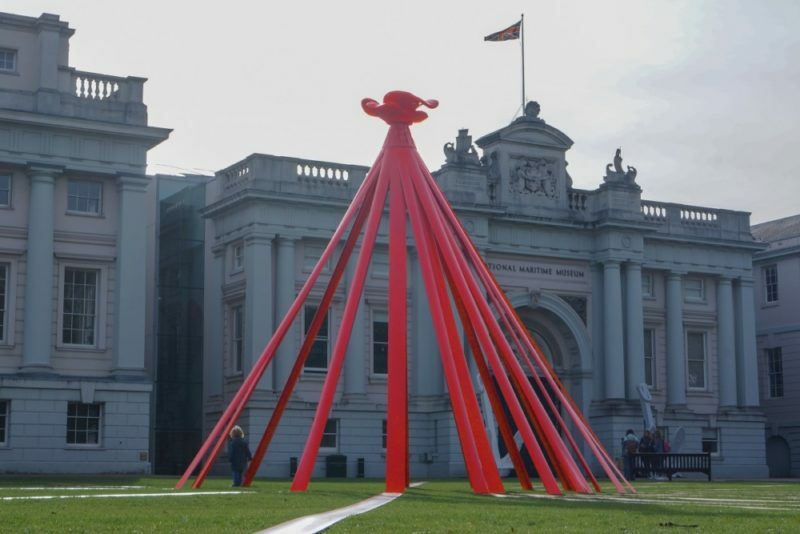 To launch the appeal, a six metre high poppy installation has been unveiled to the public at the National Maritime Museum in Greenwich, London. 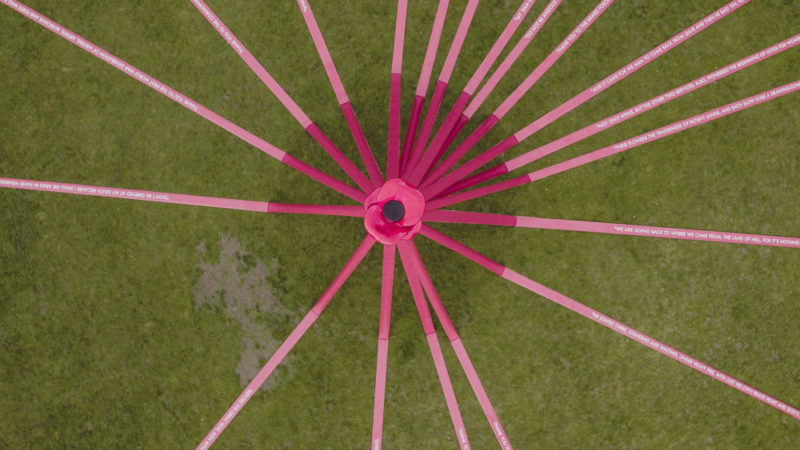 Poppy red threads featuring messages from the First World War generation reach out from this central point and are positioned to face in the exact direction of poignant partner locations across the UK. The installations aim to highlight how the legacy of the First World War is woven through the fabric of the nation, often in unexpected places. The messages written on the threads and the locations have been chosen to acknowledge the wide range of contributions from across the First World War generation. Birmingham’s thread reads: “My ‘Sam Gamgee’ is indeed a reflexion of the English soldier, of the privates and batmen I knew in the 1914 war, and recognised as so far superior to myself”, a quote from J. R. R. Tolkien. As a young boy, Lord of the Rings author Tolkien spent his childhood exploring the countryside around Birmingham, finding inspiration for some of the scenes in his books including Bag End, based on his Aunt’s House. When war broke out, it was at the Plough and Harrow Hotel in Birmingham in 1915 that he said farewell to his family and left for the front. 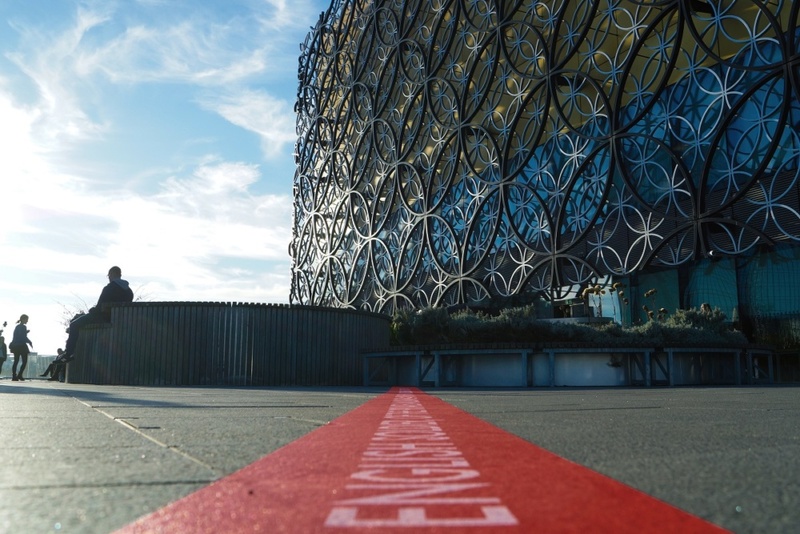 Less than a mile from that point, the Library of Birmingham now stands and contains Tolkien’s works, many of which include elements inspired by his experiences serving as an Officer in the Lancashire Fusiliers. After Tolkien was medically evacuated from the Somme in 1916, almost all of his entire battalion were killed. Jane Britton, Area Manager West Midlands, said: “During the Poppy Appeal 2018 and as we mark the end of the First World War centenary in this historic year, we are calling on the nation to say ‘Thank You’ to the First World War generation; not only the British Armed Forces, but those who fought alongside them from today’s Commonwealth, the countless men, women and children who played their part of the home front and the pioneers and artists who have left long lasting legacies. “The work of the Legion is as relevant and vital today as it was in the aftermath of the First World War when the charity was founded. The donation for your poppy will help the Legion support today’s Armed Forces community through hardships, injury and bereavements. Generations of the Armed Forces have continued to serve and sacrifice since the First World War, and we recognise and thank them all for their unique contribution. The Legion uses donations to offer life-long support to the Armed Forces community including providing crisis grants, researching the changing impact of blast injuries on the body, lobbying the government on issues that affect our Armed Forces community, specialist dementia care, sport and art based recovery programmes and advising on benefits and money problems. What and when is the Poppy Appeal? • The Poppy Appeal runs from Thursday 25 October to Sunday 11 November, which this year marks both Armistice Day and Remembrance Sunday. • The Legion’s ‘Thank You’ movement was launched in August to mark the end of the First World War centenary and will culminate at the end of the Remembrance period on Sunday 11 November. • The Poppy Appeal target for 2018 is £50million – the biggest target ever. • Last year the Poppy Appeal raised £46.6million. • During the Poppy Appeal over 40million poppies will be distributed by 40,000 volunteers. • The ‘Thank You’ movement currently has over 60 corporate partners and 500 community activities planned. • Each year The Royal British Legion supports hundreds of thousands of people from our Armed Forces community through simply providing information and guidance to life saving help. 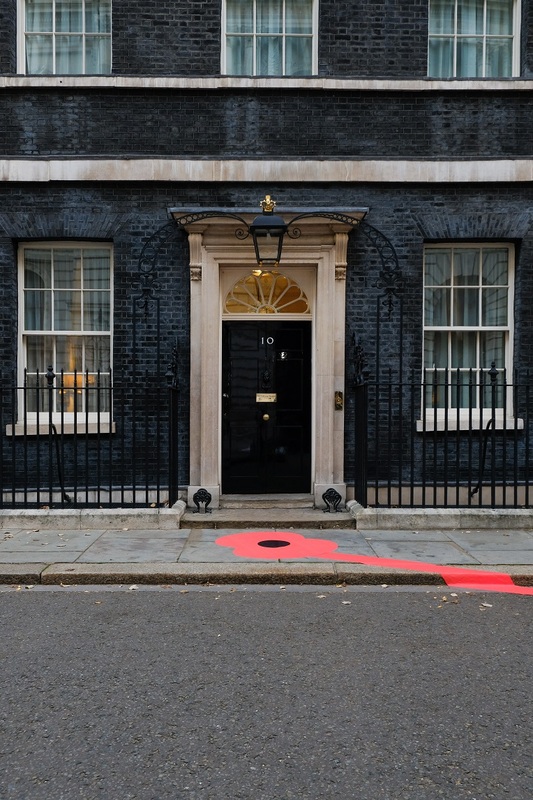 The Poppy Appeal installations are available for the public to visit and timings are available on the Legion’s website at rbl.org.uk.